Hodder & Stoughton Ltd, 1980-06-01. Hardcover. Used:Good. 1983-03-08. New. Ships with Tracking Number! INTERNATIONAL WORLDWIDE Shipping available. Buy with confidence, excellent customer service! 1983-05-04. New. Ships with Tracking Number! INTERNATIONAL WORLDWIDE Shipping available. Buy with confidence, excellent customer service! 1983-11-01. New. Ships with Tracking Number! INTERNATIONAL WORLDWIDE Shipping available. Buy with confidence, excellent customer service! 2015-09-08. New. Ships with Tracking Number! INTERNATIONAL WORLDWIDE Shipping available. Buy with confidence, excellent customer service! 1981-01-01. New. Ships with Tracking Number! INTERNATIONAL WORLDWIDE Shipping available. Buy with confidence, excellent customer service! 1980-01-01. Good. Ships with Tracking Number! INTERNATIONAL WORLDWIDE Shipping available. May not contain Access Codes or Supplements. May be ex-library. Shipping & Handling by region. Buy with confidence, excellent customer service! 2012-05-02. New. Ships with Tracking Number! INTERNATIONAL WORLDWIDE Shipping available. Buy with confidence, excellent customer service! 1995-12-31. New. Ships with Tracking Number! INTERNATIONAL WORLDWIDE Shipping available. Buy with confidence, excellent customer service! 1991-09-27. Good. Ships with Tracking Number! INTERNATIONAL WORLDWIDE Shipping available. May not contain Access Codes or Supplements. May be ex-library. Shipping & Handling by region. Buy with confidence, excellent customer service! 2002-07-01. Good. Ships with Tracking Number! INTERNATIONAL WORLDWIDE Shipping available. May not contain Access Codes or Supplements. May be ex-library. Shipping & Handling by region. Buy with confidence, excellent customer service! 1981-03-02. Good. Ships with Tracking Number! INTERNATIONAL WORLDWIDE Shipping available. May not contain Access Codes or Supplements. May be ex-library. Shipping & Handling by region. Buy with confidence, excellent customer service! 1983-11-01. Good. Ships with Tracking Number! INTERNATIONAL WORLDWIDE Shipping available. May not contain Access Codes or Supplements. May be ex-library. Shipping & Handling by region. Buy with confidence, excellent customer service! 1980-05-05. Good. Ships with Tracking Number! INTERNATIONAL WORLDWIDE Shipping available. May not contain Access Codes or Supplements. May be ex-library. Shipping & Handling by region. Buy with confidence, excellent customer service! 2006-01-06. Good. Ships with Tracking Number! INTERNATIONAL WORLDWIDE Shipping available. May not contain Access Codes or Supplements. May be ex-library. Shipping & Handling by region. Buy with confidence, excellent customer service! Bantam Books. Used - Acceptable. Ships from Reno, NV. Former Library book. Shows definite wear, and perhaps considerable marking on inside. 100% Money Back Guarantee. Shipped to over one million happy customers. Your purchase benefits world literacy! Bantam, 1983-11-01. 2 Revised. Paperback. Used:Good. 2008-07-01. Good. Ships with Tracking Number! INTERNATIONAL WORLDWIDE Shipping available. May not contain Access Codes or Supplements. May be ex-library. Shipping & Handling by region. Buy with confidence, excellent customer service! Hodder & Stoughton Ltd. Hardcover. 0340252618 Like New Condition. . Fine. Hodder & Stoughton Ltd. Hardcover. 0340252618 New Condition. . New. 452 Pages.Translated by William Neil. Previous owner's name on inside front cover. No book in the whole history of mankind has had such a revolutionary influence, has so decisively affected the development of the western world, or had such a world-wide effect as the "Book of Books," the Bible. Size: 5 1/2" x 8 1/2"
BN Publishing. Hardcover. 9650060162 New Condition. . New. William Morrow & Co. Hardcover. 0688037240 New Condition. . New. William Morrow. Hardcover. B000OYH4DI New Condition. . New. Bantam. PAPERBACK. 0553279432 New Condition. . New. Bantam. MASS MARKET PAPERBACK. 0553254383 New Condition. . New. Bantam Books. MASS MARKET PAPERBACK. 0553242008 New Condition. . New. BN Publishing. PAPERBACK. 9659124155 New Condition. . New. Bantam Books, Inc.. PAPERBACK. 055327144X New Condition. . New. 1983-05-04. Good. Ships with Tracking Number! INTERNATIONAL WORLDWIDE Shipping available. May not contain Access Codes or Supplements. May be ex-library. Shipping & Handling by region. Buy with confidence, excellent customer service! 1995-12-31. Good. Ships with Tracking Number! INTERNATIONAL WORLDWIDE Shipping available. May not contain Access Codes or Supplements. May be ex-library. Shipping & Handling by region. Buy with confidence, excellent customer service! 2012-05-02. Good. Ships with Tracking Number! INTERNATIONAL WORLDWIDE Shipping available. May not contain Access Codes or Supplements. May be ex-library. Shipping & Handling by region. Buy with confidence, excellent customer service! London : Hodder & Stoughton, 1957. Fourth Edition. Near fine copy in the original gilt-blocked cloth. Slightest suggestion only of dust-dulling to the spine bands and panel edges. Remains particularly well-preserved overall; tight, bright, clean and strong; 8vo 8"" - 9"" tall; 429 pages; Physical desc. : xxiii, 429 p. : ill. , maps. ; 22 cm. Translation of Und die Bibel hat doch recht. Includes index. Bibliography: p. 415-419. 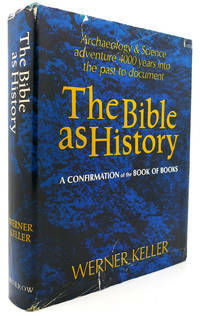 Subject: Bible - History of contemporary events - Antiquities. Condition: Near fine copy in the original gilt-blocked cloth. Slightest suggestion only of dust-dulling to the spine bands and panel edges. MORROW. New. 8.05 x 6.32 cm. New York: William Morrow & Company, Inc.. Fine in Fine dust jacket. 1981. Hardcover. A Fine edition that has an embossed stamping on the title page housed in a like dust-jacket the front cover of which bears the same embossed stamping ; . 1983-03-08. Good. Ships with Tracking Number! INTERNATIONAL WORLDWIDE Shipping available. May not contain Access Codes or Supplements. May be ex-library. Shipping & Handling by region. Buy with confidence, excellent customer service! Bantam Books. MASS MARKET PAPERBACK. 0553242008 Like New Condition. . Fine. William Morrow. Hardcover. B000OYH4DI Like New Condition. . Fine. Bantam. PAPERBACK. 0553279432 Like New Condition. . Fine. William Morrow & Co. Hardcover. 0688037240 Like New Condition. . Fine. BN Publishing. PAPERBACK. 9659124155 Like New Condition. . Fine. Bantam. MASS MARKET PAPERBACK. 0553254383 Like New Condition. . Fine. Bantam Books, Inc.. PAPERBACK. 055327144X Like New Condition. . Fine. New York: William Morrow & Company. 1956. Book Club Edition. Hardcover. Very Good- in a Very Good- dust jacket. Tears to jacket. Boards are slightly bowed. ; 8vo 8" - 9" tall; Original dust jacket protected by archival Brodart cover. All domestic orders shipped protected in a Box. .
New York: William Morrow and Company. 1964. First Edition; Fifteenth Printing. Hardcover. Very Good in a Goodprice clipped dust jacket. Bumping at bottom and top of front panel. Light chipping at spine crown. Multiple tears throughout jacket. Large open tear to bottom front panel. ; Original dust jacket protected by archival Brodart cover. All domestic orders shipped protected in a Box. .